Gunna's latest single from his upcoming album Drip Or Drown II is here. The Atlanta rapper's "Speed It Up," produced by Turbo, can be heard above via Complex. It's the second Drip Or Drown II single after "One Call." 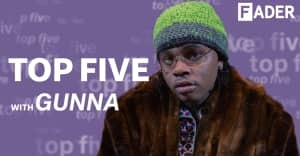 Last week, Gunna shared a lot of tour dates for the upcoming Drip Or Drown II tour. Check those out here, along with the $1,000 surfboard that's part of a new merch drop. Drip Or Drown II is out February 22.